Biotech cleans up in the NYTimes Learning Network found poetry contest! April is the cruellest month, but the fact that it’s Poetry Month makes it much more bearable. This year, I had my students (froshies and juniors) submit their found poetry to the NY Times 5th annual found poetry contest. The challenge is to write a poem (14 lines or fewer) made almost completely of words from New York Times articles (they can have two of their own words if desired). I gave students a little more than an hour to work on their poems, and they finished them up on their own time. Fortunately for us, we have 16 copies of The Times come to school every day, so we had a nice stock pile of papers. First I must note that I was so impressed by all the poems that my students wrote. This activity may sound easy because the words are already there, but I think you’d be surprised by just how difficult it can be! I was so pleased with their work, freshmen and juniors alike. According to the Learning Network Blog, there were upwards of 2,000 entries submitted. Of those 2,000, four Biotechers were honored! Check them out, and if you see them in the hallways, congratulate them! Click the student’s name to read his or her poem. 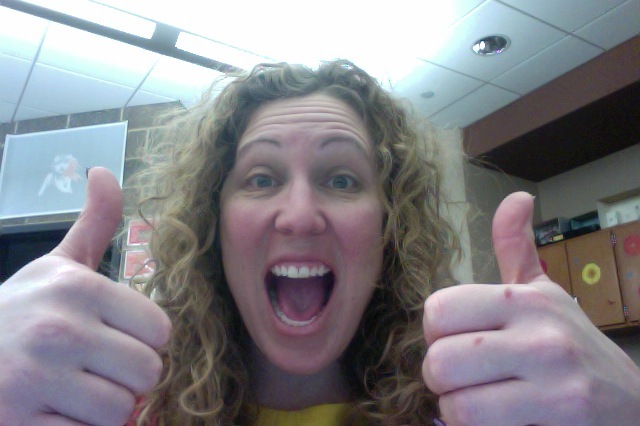 Who has two thumbs and is crazy proud right now? This girl!